Jeff Snider - How Long Can Buybacks Continue To Support A Market Which Is Standing On A Fundamentally Flawed Premise? What’s even more concerning is that not even is the top line falling off, but the cash flow is falling dramatically and this impacts credit along with everything else. With no earnings and no cash flow it puts us in a high risk environment. The only thing that has been holding up the market has been excessive corporate buybacks which has come out of cash flow, and to a lesser degree, borrowing. But to borrow is tough when you don’t have the cash flow to justify the credit ratings. 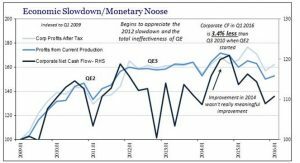 We have had 4 to 5 quarters of falling revenue but the US market seems to ignore it. At some point reality has got to set in. But it is also important to note that trade problems are a systemic factor to the decline in earnings. China’s imports are down 17% year over year, but these imports are coming from basically the emerging markets and commodity markets. 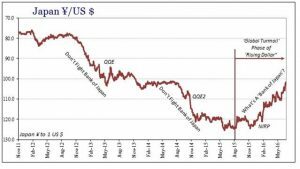 They have also borrowed upwards of 9 trillion USD in the last 7 years that has suddenly gotten very expensive for them, I think there is more pain to come. 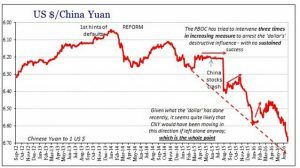 Less growth in China combined with less growth around the world again increases financial risk which fuels more reluctance to funnel dollars into China; it has become a vicious cycle. The Chinese have no choice but to continue going in one direction, they are in a rock in a hard place. 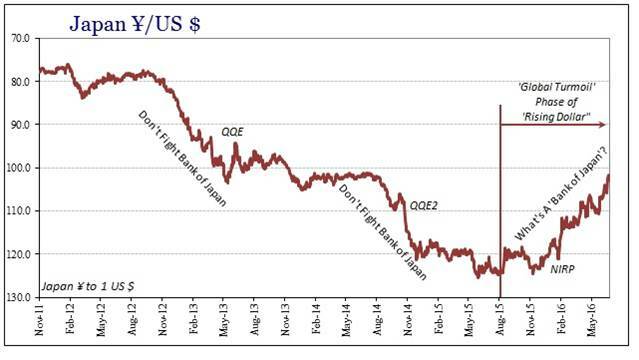 As the Chinese Yuan has been falling, the Yen has been rising in strength. This has become a huge issue for Japan to add to their already lost list of issues to deal with. 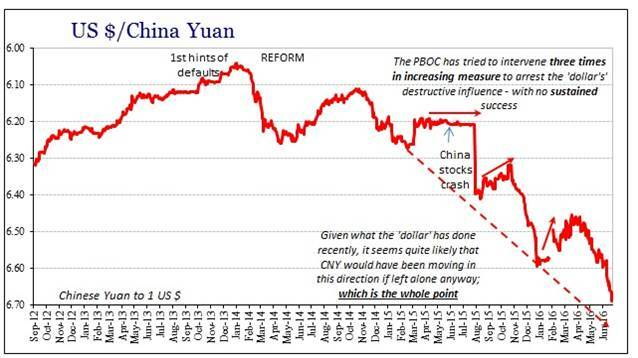 A fracture is likely around the corner, China and Japan cannot go long without devaluing the Yen. The markets are reassessing what central banks can actually do. And what markets found was that central banks aren’t actually as powerful as everyone believes them to be and Japan is a perfect example of that. No matter what the BOJ does that Yen continues to move on up. It fits into the paradigm of the economy, the financial risk, everyone reevaluating what central banks are capable of etc. The markets are reevaluating central banks because they see that a tight money environment despite efforts from central banks to fuel stimulation. What I see is an unstable global currency regime which we are completely unprepared for. There is no solution that has been presented that would allow for a stable currency to take over Euro dollars which clearly doesn’t work. Generally the central banks can fix liquidity problems, but they cannot fix solvency problems. We see that the credit cycle has turned from non-performing loans so on and so forth. 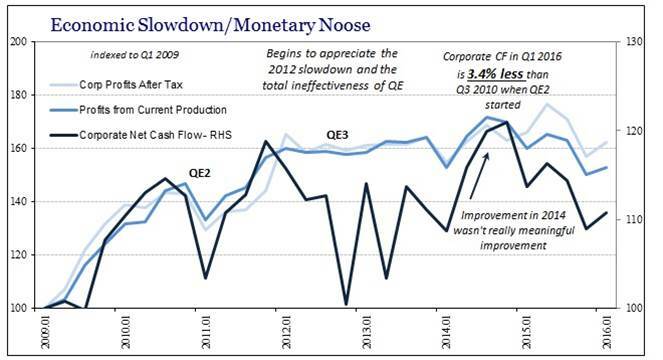 The idea behind QE for Japan, America and Europe was to kick start a robust recovery. Now that central banks has lost credibility as well as support. Then you have all the unintended consequences that come with almost zero money. We have nearly zero price discoveries and risk is greatly mispriced. Desperation is a big role of why markets are reevaluating central banks. If we go back 20 years where Alan Greenspan was a genius and he didn’t even do anything, all he did was talk and he made a career out of not talking. No matter what he did he was taken as a genius. Whereas 20 years later, Janet Yellen sounds like a fumbling idiot no matter what she does. All her actions come across as desperate because the credibility has been blown away. The Fed has been forced into action and by being forced into action it has only highlighted what the Fed can’t do. We need to look at this as an opportunity in the long run. Now that the power of central banks has come to surface and credibility has been shot, it in turn opens the door to credible solutions. The fact of the matter is that the economy is nothing like what it should be and people know that something is wrong and change is needed.